I was thinking one day about my teaching philosophy and realized that my role as a belly dance teacher is to help each student find their own dance style and to guide them through this process. I’m merely providing the tools (such as technique, musicality, styling, safety, etc), the best I can. The goal for a belly dance soloist is to be unique, original, and creative while keeping the character of this dance form. For example, many of the current famous dancers (Egyptian or international) were students of the same teacher (notably, Mahmud Reda or Raqia Hassan), and yet they are so different. Every one of them has her own unique dance signature, which is recognizable and inimitable. One can’t be famous if he/she is not original, in other words, creative. As much as we love classical belly dancers, such as Samia Gamal, Soheir Zaki, Fifi Abdou, etc, we don’t want to be known as “the dancer who dances like Samia Gamal”. That, of course, for those who are considering a solo career. Nonetheless, it’s perfectly ok for a student to want to do only group numbers, or to come to class for exercise and fun, or not wanting to perform at all. There is enough satisfaction and challenge in just attending a class without the pressure of performing in public. In the same time, I do encourage my students to take classes with other teachers, to attend workshops, and even to try different dance forms, and I’m happy to make recommendations as to what workshop to attend, which teacher, and what to expect. Every teacher has something new to say or explain a certain movement in a different way that might click better with a student. There is something to learn from everyone. To be able to develop as unique dancers, we need to be exposed to everything that’s out there (dance-related) and to get as many learning opportunities as we can. Online classes either live or recorded add even more opportunities to learn. However, I don’t recommend exclusively online training, especially for beginners. Live online classes with good visual between the teacher and the student are great tools for most levels, but I recommend adding in-person classes for beginning levels. The teacher need to see how your body is moving and provide feedback to correct some of the moves, or add additional cues depending on student’s individual body type. Live online classes are very convenient, saving time and money with excellent results. But they do require access to technology – a computer (it can be an i-Pad, a laptop, or a desk PC), wi-fi or good internet connection. Recorded class work better for more advanced level (intermediate to advancing). They range from focused techniques for specific moves to entire choreographies. However, they obviously don’t allow interaction with the instructor for questions or review, so sometimes, students need to contact the teacher for written clarifications, or even a private live class. Cross-training in other dance styles is extremely beneficial for those committed to improve their dancing, and have the resources to do so. For me, taking hula classes has helped me not necessarily with moves technique, but with other aspects of dance discipline, such as improving legs-arms coordination, directional changes, counting and being on beat, musicality, and more! Talking about learning belly dance brings me to another topic that’s I’ll touch briefly here. 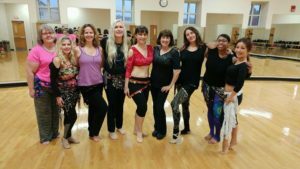 For the unacquainted public with little exposure to belly dancing or knowledge about it, what we do seems easy, nothing more that shaking and wiggling and spinning (sadly, sometimes it’s presented that way by some dancers). But, as one of my previous students said, it’s actually deceivingly hard. We didn’t wake up like this one day and decided that “I’m going to be a belly dancer from now on”. Every move has a name, a specific technique that we learn and hone over the years. Moves have names such as shimmies, undulations, arabesque, turns, traveling steps, mayas, omies, and so on. We can spend days or weeks to learn a move or a step that takes only 4-8 seconds, or an accent that takes one second to do on stage. For an average student, it takes about two years to be comfortable with basic body isolations, and another two years to master the core moves. Most belly dancers start their solo career after 5-6 years of training, which actually never stops. Belly dance is so unique and beautiful, and it provides so much joy and happiness to both the dancer and the audience that it’s no wonder that it’s spread all over the world! Keep on dancing!